Greenwater is a census-designated place (CDP) in Pierce County, Washington, United States. The population was 67 at the 2010 census. Based on per capita income, Greenwater ranks 17th of 522 areas in the state of Washington to be ranked. It is also the highest rank achieved in Pierce County. Greenwater gains much of its popularity as a town for hikers and skiers on their way to Mount Rainier National Park. Three popular campgrounds reside in Greenwater: Silver Springs, The Dalles, and Buck Creek. Greenwater is located at 47°8′32″N 121°37′8″W﻿ / ﻿47.14222°N 121.61889°W﻿ / 47.14222; -121.61889 (47.142294, -121.618926). According to the United States Census Bureau, the CDP has a total area of 1.5 square miles (3.9 km²), all of it land. Greenwater is located at the confluence of the Greenwater River and White River. Greenwater has a warm-summer Mediterranean climate (Csb) according to the Köppen climate classification system. As of the census of 2000, there were 91 people, 46 households, and 17 families residing in the CDP. The population density was 61.2 people per square mile (23.6/km²). There were 65 housing units at an average density of 43.7/sq mi (16.8/km²). The racial makeup of the CDP was 92.31% White, 2.20% Native American, 1.10% Pacific Islander, and 4.40% from two or more races. Hispanic or Latino of any race were 1.10% of the population. There were 46 households out of which 6.5% had children under the age of 18 living with them, 30.4% were married couples living together, 4.3% had a female householder with no husband present, and 60.9% were non-families. 37.0% of all households were made up of individuals and 4.3% had someone living alone who was 65 years of age or older. The average household size was 1.98 and the average family size was 2.61. In the CDP, the population was spread out with 8.8% under the age of 18, 16.5% from 18 to 24, 35.2% from 25 to 44, 34.1% from 45 to 64, and 5.5% who were 65 years of age or older. The median age was 41 years. For every 100 females, there were 122.0 males. For every 100 females age 18 and over, there were 112.8 males. The median income for a household in the CDP was $39,545, and the median income for a family was $75,487. Males had a median income of $75,282 versus $41,250 for females. The per capita income for the CDP was $36,466. None of the population or families were below the poverty line. 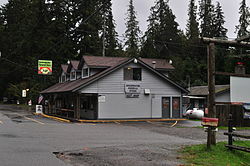 Wikimedia Commons has media related to Greenwater, Washington. ^ "GREENWATER, WASHINGTON (453357)". Western Regional Climate Center. Retrieved November 16, 2015.